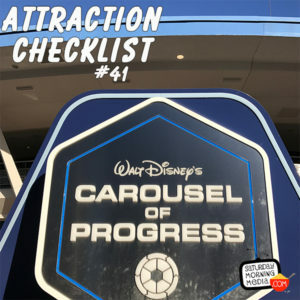 http://www.attractionchecklist.com – It’s time to experience an iconic Disney attraction, Walt Disney’s Carousel of Progress at Walt Disney World’s Magic Kingdom. Joining me is John B. deHaas. We learn a little about the attraction and then give it a ride. Recorded on May 25, 2017. It’s time to experience a classic! This episode we head to Walt Disney World’s Magic Kingdom to take a spin on Walt Disney’s Carousel of Progress. Located in Tomorrowland, the guide map describes this attraction thusly, “Travel through the 20th Century to see how technology has improved our way of life.” There are no age or height requirements for this attraction and the thrill level describes this attraction as being a slow ride. Before we answer the age old question of just what is shining at the end of every day, here are five fast facts about Walt Disney’s Carousel of progress. 1. In the 1950’s Walt Disney came up with the foundation of the idea for the Carousel of Progress but the technology available to the Imagineers at the time made it impossible. It wasn’t until General Electric approached Walt Disney to develop a show for the 1964//65 World’s Fair that Walt was able to make the show a reality, opening on April 22, 1964. After a successful run at the Fair, the show was moved to Disneyland where it opened on July 2, 1967. The show ran at Disneyland until September 1973 when it was moved, at General Electric’s urging, to Walt Disney World. The show opened at the Magic Kingdom on January 15, 1975 and still runs daily at the time of this recording. 2. The carousel theatre concept, where the audience revolves around the stage, was developed by a team of imagineers led by Bob Gurr and Roger E. Broggie. This allowed the guests to remain seated during the duration of the show rather than getting up and moving to the next theatre as had been the original plan. 3. The attraction’s iconic song, There’s A Great Big Beautiful Tomorrow’ was written by Disney Legends, The Sherman Brothers. When it first opened at Walt Disney World, it had a new song, also written by the Sherman Brothers called The Best Time Of Your Life. In 1993, when the show was given a major overhaul and an update, There’s A Great Big Beautiful Tomorrow returned to the show. The Sherman Brothers have stated that that song, There’s A Great Big Beautiful Tomorrow was Walt Disney’s Theme Song as he was always so optimistic about the future. 5. Of the 32 different audio animatronic figures in the attraction, a crowd favorite is Rover, the family dog. In the current show, Rover is the dog’s name the entire time. When the attraction first opened at Walt Disney World, the dog had a different name in every scene including Buster, Sprot, Quieenie and Rover. Now let’s sit back and enjoy Walt Disney’s Carousel of Progress. Joining me today is John B. dehaas and after the ride audio we’ll give you our shouts on this classic attraction. This is a binaural recording so if you have headphones, put them on now as we are about to experience Walt Disney’s Carousel of Progress at Walt Disney WOrld’s Magic Kingdom!